In the first six months of Apple's current fiscal year, the device maker realized revenue growth of 66.35% and earnings per share growth of 104.03%. The successful release of the iPhone 4S and the addition of new carriers such as Sprint pushed recognized revenue from iPhone sales up nearly 107% in the six-month period and represented 55% of the company's revenue total. On July 24th, Apple will release results for the fiscal quarter ended June 30th. While I don't expect the pace of revenue and earnings growth in the June quarter to match the rates of growth realized in the first six months of the fiscal year, I do expect Apple to report strong growth in what I am calling "Apple's Competent June Quarter." For the quarter, I expect revenue growth of 41.37% to $40.391 billion and eps growth of 53.40% to $11.95 per share. In the June quarter I expect the Apple iPad line to have delivered the largest percentage of year-over-year revenue growth among Apple's major device lines while the iPhone will deliver the biggest revenue growth numbers. Combined, I expect the iPhone and iPad to deliver 75% of the quarter's recognized revenue total. The table below details my June quarter unit sales and revenue estimates by product line. In the year-over-year revenue comparisons, I have consolidated iPod revenue with revenue from software and peripherals. Revenue from iPod unit sales will be below $1 billion in the quarter and the product line will have only a marginal impact on the quarter's results. For the quarter, I estimate 29.70 million iPhone units sold. This represents a 46% year-over-year units sales growth expectation and an anticipated 15% sequential decline in reported unit sales. In the March quarter, Apple reported unit sales of 35.064 million iPhone units which included an increase of 2.6 million units in channel supply. Actual sell-through in the quarter was a bit below 32.5 million units. Apple began the June quarter with 8.6 million iPhone units in the global channel. I expect Apple to have made adjustments to channel supply before the end of the June quarter and for iPhone sell-through in the three-month period to be closer to the March quarter outcome than my reported unit sales estimate might otherwise suggest. The iPhone 4S is an attractive handset that delivers very high gross margin. However, I believe unit sales peaked in the quarter of introduction and I expect the next big spike in quarterly iPhone unit sales to occur following the introduction of a new flagship iPhone model. The Apple iPad is only now emerging from its nascent phase of global market development and I expect the product line to have performed extraordinary well in the June quarter's annual education buying season. Education sales and fast enterprise adoption of the new iPad will have delivered very strong unit sales results for Apple's tablet-style product line. For the June quarter I estimate iPad unit sales of 20.5 million units, representing year-over-year unit sales growth of nearly 122% and a sequential gain in unit sales of about 73.75%. Apple ended the March quarter with scant supplies of the new iPad in the channel and production levels will influence the quarter's results. In late May, Apple received regulatory approval to commence sales of the new iPad on China's mainland and at the start of the current quarter the company resolved its trademark dispute with Proview for the iPad name. The successful roll out of the new iPad on the mainland later this month will significantly boost the September quarter's iPad unit sales results. Please visit the article linked in the first paragraph of today's post for an analysis of Apple's recent revenue growth by geographic region. Apple's Macintosh line of personal computers is the best example of what I call the "Apple Product Mutual Halo Effect." Outside of the Macintosh line, the global PC industry is in a state of economic decline. Against a back drop of an industry in decline, I expect a June quarter Macintosh unit sales growth rate of almost 10% to 4.33 million units. Macintosh unit sales benefit from high Apple retail store foot traffic that follows the annual refreshes of the iPhone and iPad product lines. The Macintosh line also benefits from the opening of new retail stores. The popularity of Apple's iOS-based devices is driving Mac adoption among the company's expanding base of product users. Late in the June quarter, Apple refreshed the Macintosh portable lines and added the Retina display to select MacBook Pro models. The new MacBook Pros will deliver impressive unit sales growth in the September quarter. But the timing of the refresh late in the quarter and the impact of the iPad on education channel sales suggest a good but not sensational quarter for Apple's oldest and most enduring product line. I expect revenue growth in the June quarter of just over 41% based on strong iPad unit sales growth and a respectable unit sales performance for the iPhone 4S as it approaches the end of its reign as Apple's flagship iPhone model. Over the first six months of the current fiscal year, Apple averaged a gross margin of 45.9%. I expect only a slight moderation of gross margin in the June quarter due to a higher percentage of total revenue delivered by the new iPad and the iPad 2 at a reduced price. I expect operating expenses in the June quarter to have consumed less than 8.25% of revenue, inline with the 8.12% of revenue consumed by operating expenses in the March quarter. Operating expenses are comprised of R&D and selling, general and administrative expenses. Apple's operating expense discipline contributes to the company's high percentage of recognized revenue that flows to the net income line. High gross margin and operating expense discipline combined with strong revenue growth result in an expected 37.07% of revenue flowing to the operating income line. In the March quarter 39.26% of revenue flowed to the operating income line. I estimate OI&E for the June quarter at $170 million dollars, up from the $148 million reported in the March quarter. Apple is generating cash at the rate of $1 billion or more each week and both the dividend reinstatement and planned share repurchase program can be amply financed with a fraction of domestic net income and without an impact on the company's current cash balances. In the first six months of the current fiscal year, Apple's average reported tax rate on pre-tax income was 25.21%. I expect an effective tax rate in line with the recent trend. 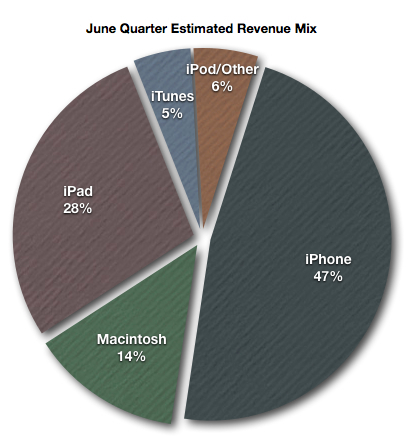 I estimate Apple's June quarter net income at $11.323 billion. This represents an estimated 28.03% of revenue flowing to the net income line. In a recent article titled, Apple's Net Income Thrill Ride, I provided an analysis on Apple's rising net income per revenue dollar. Below is a chart from that article. Apple's high gross margins driven by superb supply chain management and the company's operating expense discipline will deliver a third consecutive quarter with net income equal to or greater than 28% of recognized revenue. Based on estimated net income of $11.323 billion and an estimated fully diluted count of 947.725 million shares, my earnings per share estimate for the quarter is $11.95. This represents an estimated year-over year gain of 53.32% and an estimated sequential decline of about 2.93% from the March quarter's $12.30 eps performance. Apple remains in an era of extraordinary revenue and earnings growth. I expect the June quarter's revenue and eps growth rates to represent the low ebb of a sensational six-quarter cycle that began with the first quarter of the current fiscal year. The Braeburn Group's AAPL June Quarter Estimate Index is now available for viewing on the Group's home page. The Braeburn Group was founded earlier this year to provide a robust discussion environment for an international network of bloggers and active Apple independent analysts. There are no fees to become a member of the Group, but enrollment by a site administrator is required to view and participate in the Group's discussions. Please see the Group's home page for membership information.